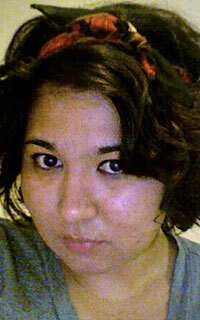 Spring has sprung and the trend of the season is hair scarves. Leopard, floral, nautical, you name it, you can rock it. The Curl Talk boards have been buzzing about this trend for a while now to help with growing out hair and now the trend is popular amongst all styles of hair. As a fellow wavy woman, I can appreciate any accessory that has so much versatility as well as protecting and moisturizing my curls. After searching the trend on Pintrest and Youtube, I came across several different ways to accessorize your hair with scarves and grabbed the easiest and the key ways to adorn your waves. If you love the pinup look, or are just looking for a cute scarf headband with a bow, look no further. This classic look is simple and you can use a bandana or a scarf in four easy steps. You will need a medium size bandana or scarf to create this look. Fold the scarf in half diagonally touching corner to corner. Fold the bottom half of the scarf horizontally at the width you would like on the bottom of your head. Place the scarf at the nape of your neck underneath the hair and position the two ends on the crown of the head where you would like the top to sit. If you have bangs that you would like to wear with the scarf, position the ends at the base of your bangs. Take both ends and tie a taught knot or bow. You will not need the scarf too tightly, but it does need to have some tension to hold your hair and the scarf in place. If you have a longer scarf, you can double wrap the scarf to add more width or more style to the headscarf. Follow steps one and two above. Place the scarf on the crown of your head with the ends going towards the bottom of the back of your head. Wrap the scarf instead of tying a knot at the bottom and bring the ends towards the top and secure firmly with a knot or if your feeling lucky, a rose knot. For a headband look, follow the original instructions and wrap the scarf at the crown of the head and tie the ends on the bottom. Going to the beach and looking for some coverage for your waves? A head wrap is a great way to cover up and protect your hair, to rehydrate your curls while you deep condition or if you just need to run a quick errand. As you have always heard, satin is the best for curls, (if you have not heard the word, satin is kind to curls) especially if you are looking for the benefits of wrapping your hair in a scarf. 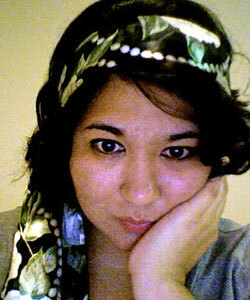 Fold the bottom half of the scarf horizontally at the width you would like to show off on top of your head. You will want a wider base at the top of your head so that it will cover your head. 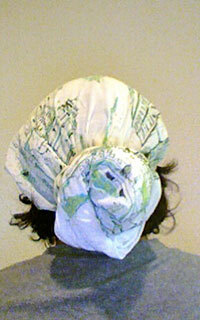 Position the scarf to cover your forehead or just to cover a portion, position on the crown of the head. Take the two ends of the scarf and bring them towards the back of your head. Secure with a knot and you can let the ends flow freely or tie into a bun. Last and definitely not the least part of the trend is to tie an accent knot into your scarves. You can secure with a regular knot, a bun, a rose tie or my favorite a Hermes knot. For a regular bun, put the two ends to the scarf together and twist them as if you were twisting around your curls and as you are twisting, wrap the scarf ends in a circular motion. For a seamless bun, tuck the ends into the bun or underneath the back of the scarf. For a rose tie, simply follow the steps above and once you tuck in the ends into the scarf, gently pull the ends to create a “rose effect”. For a Hermes knot, twist the two ends separately in the front and bring the ends to the back where you will tie a knot. I hope you have enjoyed learning about the many uses and styles for this trend. There were a couple of YouTube videos that helped me out, that I think would be beneficial for you to check out if you are more of a visual learner. 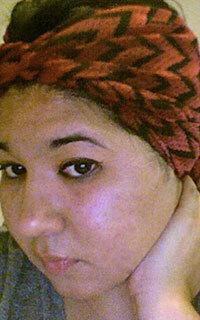 Check out: How to Tie a Turban 3 Ways and How to Spring Scarves. Until next time, keep your spirits high and your waves beautiful! Do you plan to change up your look with this hair scarf trend?